Despite its x86-sounding name, PC Tools has launched the free beta of iAntivirus, a piece of protective software designed for identifying and stopping Mac-exclusive malware. Macs and their users are subject to a number misconceptions and stigmas. Thanks in part to a particular advertising campaign, there is an ill-bred notion that Macs are impervious to malware. Critics of the company condemn Mac users for being technologically ignorant in believing their hardware is insusceptible to compromise. Over the course of 2008, PC Tools has gathered a database of 70 Mac-specific malware items that only contributes to the critically reputed nature of Mac users. Of the registered malware the group found this year, only 2% were viruses. The majority of threats against Macs were socially engineered, relying on tricks against the user to infiltrate their system. 38% of the compromises were keyloggers, 30% "hacking tools," and 11% were backdoors. 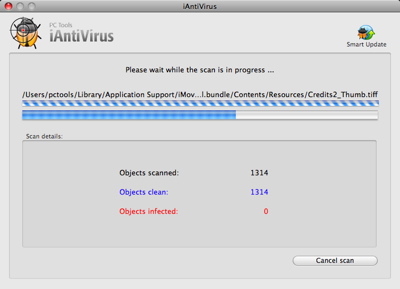 Enter iAntivirus, spyware and antivirus protection specifically for OS X (10.5+). Like other antivirus products, it provides realtime protection and automatic definition updates. The beta version is free, and requires an Intel-based Mac running Leopard. Upgrades to full support, or enterprise-level packages cost $29.95 each.